With the holidays over it’s time to take down the decorations and put them away. Sometimes though, this is easier said than done. Somehow the ornaments and decorations refuse to go back into the boxes they once filled just a month earlier. And on top of that, no matter how many plastic storage bins you buy, your decorations seem to have multiplied and never stack evenly into their containers. In today’s blog, Just Store It!, the top-rated storage facility in Elizabethton, will go over ways you can make organizing and storing your holiday decorations simple and easy. If you grew up in the 80s and 90s, then you probably have some serious packing skills thanks to your favorite block stacking game. Grab your favorite or nearest storage bin and get ready to hit a high score. Start with the larger decorations, placing them so that you can safely place smaller sized objects around them or on top of them. Lay decorations on all of their sides so that you can find the perfect angle to put other holiday ornaments around them. No matter how oddly shaped or bulky your decorations may be, you’ll always be able to flip and adjust things so that you can fit all of your decorations into your bin. Once you have your storage bin perfectly packed, put it away in your basement, shed, or storage unit until next year. Ever put away your ornaments to put them out the next year and find them shattered and broken? Overpacking can be a problem when you’re putting away your holiday ornaments and decorations as they weight of the decorations on top can make the ones one bottom break. Or maybe bumps and falls hit your decorations in the perfect spot while in their bin to make them burst. When putting away your holiday decorations, make sure fragile ones are protected by bubble wrap, boxes, or other means that will keep them intact. Cushion your decorations with softer decorations or objects and put sturdier or less fragile ornaments and decorations together to save room. Where you store your holiday decorations is very important to their longevity. While you may have room in your garage to place those ornaments and decorations, the moisture and temperature changes may be too much for some of your holiday flare to handle. If you have one, the basement may be the next best option for you. However, the basement can be a lawless place with storage bins of all kinds littering every available space. Breakages and lost objects can come in droves when you store your decoration in the basement. 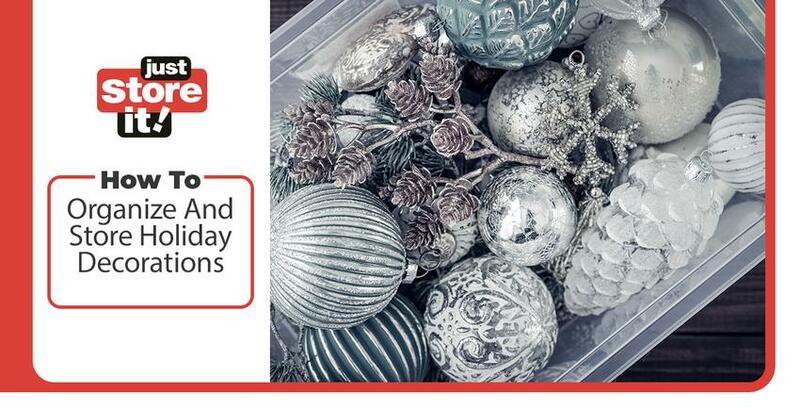 A great option is to put your holiday decorations in a storage unit. Not only are they guaranteed to be safe, but they’ll give you more space for other things in your home. If you’re looking for an amazing storage unit in Elizabethton, then the units at Just Store It! are perfect for you. See what kind of amenities you’ll get at our Elizabethton location, learn more about our company, or contact Just Store It! today to answer any questions.